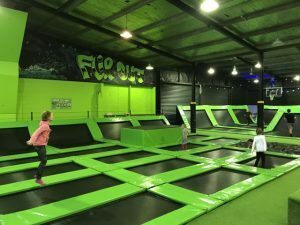 If you need to be inside burning some energy, this trampoline park is a good place to come. 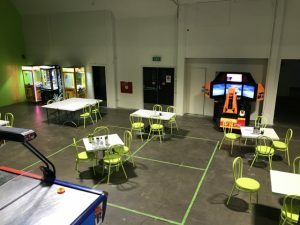 The space is split into an area for under 10s with trampolines, a box for climbing on and jumping off at a height smaller kids can manage and a mini foam pit. The rest of the park is open for all ages with a bigger foam pit, lots of side trampolines, basketball hoops, Olympic extra bouncy tramps, half pipe and huge box for jumping off (if you can get on to it!) There’s seating throughout the trampoline area if you want to watch and monitor the kids or a separate space with chairs and tables. The onsite cafe sells savoury and sweet treats like pies and slices as well as slushies and coffee. As with most trampoline parks, you need to have socks with sticky grip on them. Keep these in your car so you always have them handy. Address: 405 St Aubyn Street East, Hastings. Parking round the back of the building. Open: daily from 9am. Monday, Tuesday, Wednesday & Thursday 9am – 8pm, Friday & Saturday 9am – 10pm, Sunday 9am – 7pm. Jumping sessions start on the hour and half hour and last for 1 hour e.g. 9am – 10am or 9.30am – 10.30am. Arrive a little before your jumping session starts to complete a waiver form for each person that’s jumping. Price: $15/hour, under 5s $12/hour. Additional hour $10 per person.